Don't ask me what we were doing. 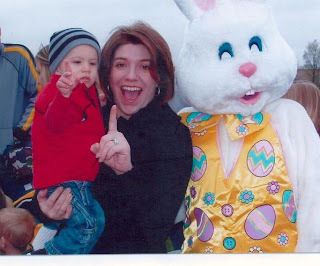 I think I was telling Linda "hang on a sec," and Seth was shaking his finger at the big scary bunny. It was a cold, miserable Easter egg hunt last Saturday, and Seth only came away with one egg (the three-year-olds in his age group were vicious! ), but it was the thought that counted, and I'm glad we went. MONICA. I've worn out the link to your blog on my favorites list these past 8 hours. Please post soon. I know you've already done your part with the text, but still, I want bloggal confirmation. xoxo!! Was that from the Easter Egg Hunt that the city did? If it was, the big scary Easter Bunny is actually my sister-in-law (Stephen's sister)! LOL!!!! !